To kick off the summer months the right way, Gino’s East is serving up some exclusively delicious beer. Through the month of July, we’re the only place in the city that will have Magnifica Wheat from 5 Rabbit Brewery. As a part of the Gringolandia series, the brewery says that Gringolandia is an affectionate term used by many Latinos to refer to the United States. And nothing says “America” like a wheat beer from one of our local Chicagoland brewers. 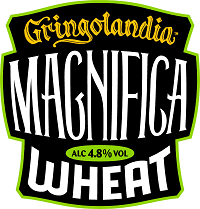 According to 5 Rabbit Brewery, Gringolandia Magnifica Wheat is a way to salute to craft beer and the melting pot that is Chicago. What better way to enjoy summer than with a crisp, refreshing beverage alongside a famous deep dish Chicago style pizza from Gino’s East? Best of all, we’re serving up this hard-to-find brew at three of our downtown locations including Gino’s East River North, Gino’s East Superior and Gino’s East South Loop. You’ll be able to enjoy an after-work spirit in the comfort of your favorite Gino’s East location, so don’t miss out on giving it a try! Serving Recommendations: 38–42 °F/3–5.5 °C. Everything tastes great in a big tulip!